Follow the Portland Thorns FC vs Seattle Reign FC steam, score and result of the 2018 NWSL Playoff at Providence Park in Portland, Oregon. Kickoff for the Portland Thorns vs Seattle is at 3PM EST. Keep following for the live outcome on VAVEL USA. Portland Thorns FC: Franch; Carpenter, Sonnett (Ball, min 90+2), Menges, Klingenberg, Boureille, Horan, Purce (Crnogorcevíc, min. 45), Sinclair Heath, Foord. Seattle Reign FC: Williams; Catley, Barnes, Oyster, Nielsen, Utsugi (Andrews, min. 82), Fishlock (Addo, min. 84), Long, Spencer (Yanez, min. 78), Taylor, Rapinoe. SCORE: 0-1, min. 28, Spencer. 1-1, min. 43, Heath, 2-1, min. 77, Horan. INCIDENTS: NWSL Playoff between defending champions, Portland Thorns FC, and the number 3 ranked, Seattle Reign FC. The match will be played at Providence Park. 14,179 spectators. Portland Thorns FC advance to the NWSL Championship game! Two unanswered goals from Heath and Horan send Portland back to defend their NWSL title. Thank you for following along this afternoon. This is Felix Hernandez for VAVEL USA hoping you enjoyed the match. Portland Thorns FC 2 - Seattle Reign FC 1. So long everybody! FT: Who will win the next semi-final? North Carolina Courage or Chicago Red Stars. Find out Tuesday night 9PM EST. FT: Injured Thorns forward Haley Raso wheeled out in her wheel chair during the Portland Thorns celebration. Raso was suffered a broken back against the Washington Spirit in Washington DC. FT: This will be the second time in two years Portland Thorns FC will advance to the NWSL Championship. FT: Portland Thorns FC will await the winner of the North Carolina Courage and Chicago Red Stars. Fulltime: Portland Thorns FC will have home field advantage in the 2018 NWSL Championship! 90+6': There is the final whistle and Portland punch their ticket to the NWSL Championship! 90+5': Portland earns a free kick deep inside of Seattle territory. 90+4: Seattle having a hard time putting presser on Portland defense. 90': 5 minutes extra time added on! 90': Rapinoe put a dangerous ball in the box but Franch is there to collect. We are coming down the final minutes of the match! 87': Sonnett goes down hard on a foul by Rapinoe who is already on a yellow. 84:' Seattle substitution: Addo IN, Fishlock OUT. 80': Chance for Yanez and Seattle but Yanez losses her footing. Ball eventually goes out for goal kick. Seattle Reign substitution: Yanez IN, Spencer OUT. 77': GOOOOOOOOOOOOOLL! Lindsey Horan! Great ball in by Sinclair to Horan's head. Off the post in and in! Portland on the front foot but Seattle holding strong. 69': Heath scores but the offside flag goes up! Its a close one! Portland and head coach Parson is not happy! 66': Foord with a hard foul on Australian teammate Williams! Williams is okay. 60': Long earns a yellow card on a hard foul on Sonnett. 58': Rapinoe has a chance from distance but is over the bar. 55': Yellow card earned by Rapinoe for a hard foul on Heath. 50': Yellow card earned by Menges on a hard foul for Spencer. 48': Heath shot! Goes wide of the net. Goal kick! 45': 2nd Half Kickoff! This will be an exciting half! HT: This match is one for the books! Looking forward to the second half. 45': Referee blows the whistle for halftime. 2 minutes extra time added to the first half. 43': GOOOOOOOOOOOLL! Tobin Heath equalizes! Foord, Horan to Heath finishes. This match is tied 1-1! 39": Fishlock earns a yellow card on a hard foul. 37': Save Franch! Taylor with a another chance but Franch is better! 28': GOOOOOOOOOOOOOLL! Jasmine Spencer! Off the rebound off a Rapinoe hits the crossbar and Spencer collects the rebound! 27': Yellow card earn by Sonnett on a hard tackle on Fishlock! 23': Chance Seattle on a rocket from Jess Fishlock! Blocked by Sonnett. 18': Another save by Williams! On a good run by Portland! 15': Good save by Franch as teams go back and forth! 8': Good save by Williams! Sinclair shot saved by Williams. 6': Chance for Portland. Sonnett free kick headed away by Utsugi. Seattle Reign FC starting lineup: Williams; Catley, Barnes, Oyster, Nielsen, Utsugi, Long, Fishlock, Spencer, Taylor, Rapinoe. Portland Thorns FC starting lineup: Franch; Carpenter, Sonnett, Menges, Klingnberg, Bouerille, Horan, Purce, Sinclaire, Heath, Foord. Portland Thorns FC injury report: OUT: Meg Morris (left hip pain - Season Ending Injury) Hayley Raso (L2-L4 transverse process fracture), Katherine Reynolds (right knee MCL repair). The injury report is out for both squads! Be sure to check back here as new information such as injuries and starting lineups become available. Then join me Saturday for LIVE game updates. Saturday will be part 4 of the Cascadia rivalry with a chance to advance to the 2018 NWSL Championship. The match will be broadcast on Lifetime at 3PM EST. 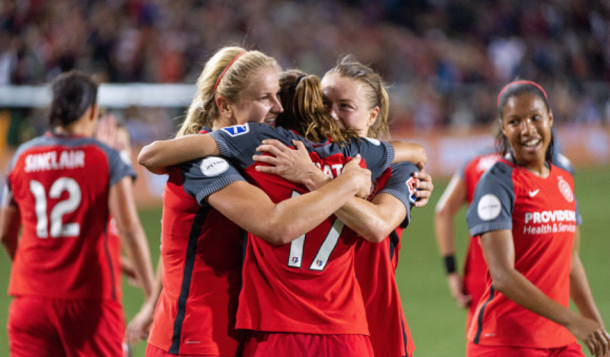 Portland Thorns FC captain Christine Sinclair told the media Tuesday, “Portland - Seattle, it doesn’t get any better than that,” as she is ready for this epic match. Portland Thorns will use their 12th man in the Providence Park crowd for motivation. Portland Thorns head coach Mark Parsons will be prepared for the return of Rapinoe and Long to Seattle’s lineup, “They will look different and we will look a little different as well… this will be a different game and we have to find a new level.” Parson is not sure Rapinoe and Long will change the dimension of the game, but quality will be on a higher level. 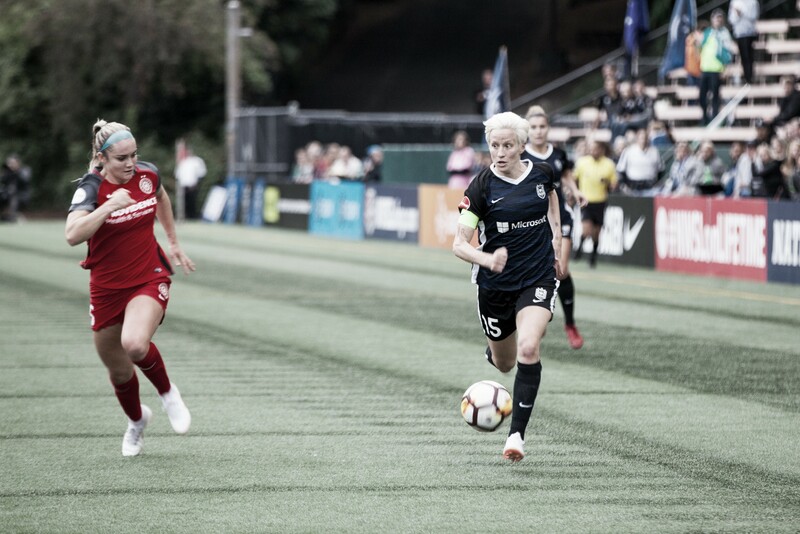 Seattle Reign FC stars Megan Rapinoe and Allie Long did not dress in the final game against Portland due to injuries. Rapinoe dealt with rib soreness and Long was still suffering from a right knee sprain. Head coach Vlatko Andonovski was optomistic about his two superstars during a media conference call, “Megan [Rapinoe] is a little bit ahead of Allie, but we’re hoping that they will be able to play and be 100 percent.” Beverly Yanez was also held out of the match due to a right foot fracture. September 7, Seattle Reign FC at Portland Thorns for home field advantage in the 2018 NWSL playoffs. Not only did Portland want to avoid the season sweep against Seattle, but they wanted to earn home field advantage for the third consecutive season. After a cracker of a goal by Jess Fishlock to give the Reign a 1-0 lead, Portland roared back from a brace by Lindsey Horan. Tobin Heath would tally the game winner in the 49th minute of the second half. Portland would clinch the second spot with a 3-1 win setting up a semi-final back at Providence Park. June 30 Portland Thorns FC at Seattle Reign FC. Jodie Taylor would score the decider in the 89th minute off a Megan Rapinoe cross. Despite Portland goalkeeper Adrianna Franch’s eight saves, the Thorns were unable to solve Seattle’s backline. Australian international Lydia Williams went on to earn a 1-0 shutout for Seattle. The Cascadia rivalry of 2018: May 5 Seattle Reign FC at Portland Thorns FC. Seattle Reign went into Providence Park to take all three points in the first matchup. The Reign got goals from Beverly Yanez and Jodie Taylor but Thorns Emily Sonnett and Lindsey Horan were able to equalize the match two seperate times. Not until the 75 minute, Japanese international, Rumi Utsugi scored the game winner from distance. Former Portland Thorns keeper Michelle Betos, now with Seattle Reign, was terrific the entire match. Betos held off Portland's late attack to claim the 3-2 victory. Portland Thorns FC and Seattle Reign FC will meet for the final time in 2018. Last week, Portland beat Seattle 3-1 to take over the second spot in the table to clinch home field advantage at Providence Park for the semi-final. The Cascadia rivals are tied in the all-time series 8W-8L-3D while Seattle hold a 2-1-0 series lead in 2018. This time the stakes will be high with a chance to advance to the 2018 NWSL Championship. This will be the 20th meeting of all time and the first time Portland and Seattle will meet in the playoffs. 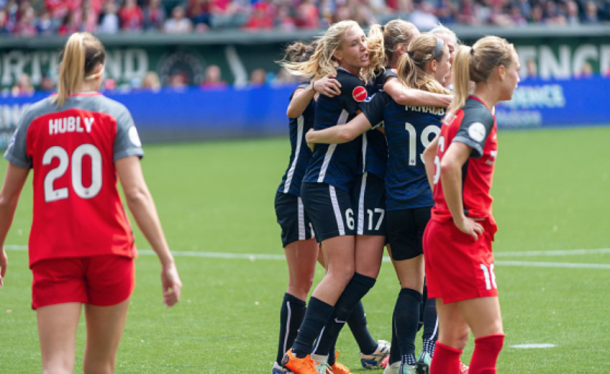 Hello and welcome to VAVEL USA’s LIVE coverage of the 2018 National Women’s Soccer League’s playoff match between the Portland Thorns FC and Seattle Reign FC. My name is Felix Hernandez and I will be your host. From now until kickoff on Saturday, September 15 at 3 PM EST, I will be keeping you updated on news and notes. Be sure to come back at kickoff for LIVE updates.